I recently came across this letter written by E.C. Mills to A.N. 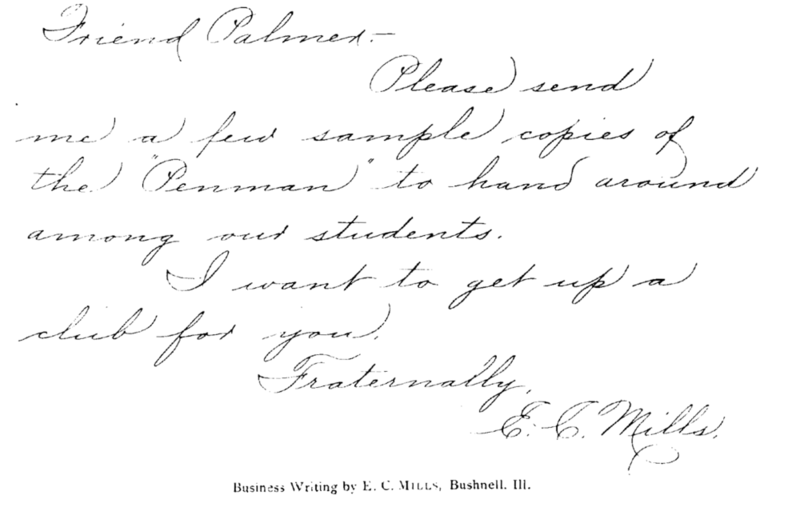 Palmer, requesting copies of Palmer’s magazine The Western Penman so that Mills might promote it with his students. Even so, the letter shows an enlightening difference between Mills’ “demonstration writing” (this, for example) and what is presumably his true everyday hand. It only takes a brief glance to see that this is not the pristine script from Modern Business Penmanship, or even this somewhat more “off-hand” letter published in an 1896 issue of Penman's Art Journal. The short, angular lowercase and the long exit strokes suggest a free and rapid execution with pure arm movement. Given the apparent swiftness with which this was written, however, the consistency and accuracy of the capitals (and that rock-solid signature!) is remarkable indeed. The apparent roughness in certain other details need not betray this letter as anything other than an example of an extremely fine business hand, though it does make an important point: handwriting is a record of a live performance—flaws and all—and we cannot expect it to be anything more. Creating a recording of a musical performance is a fascinating process, and one in which I have been lucky enough to participate a number of times. It often involves numerous “mini-performances” (takes), perhaps even of a single second’s worth of music, spliced together to create an ideal performance that is permanent and unchanging. Recording in this manner is extremely important as an act of preservation; it is true to the notes in the composer's score as well as the interpretive vision of the performers. It is not necessarily true to live performance, however. Live performance can’t capture the accuracy that a recording can, but a recording can neither ever hope to capture the essence, excitement, and sheer realness of live performance. But creating this ideal comes at the expense of speed and usefulness in practical application. As Mills' letter to Palmer shows, one can't write a letter to a friend one take at a time and then splice those takes together. The writer's words must be expressed on paper as they would be verbally. After all, writing is ultimately a vehicle for communication, not simply demonstration. I think this letter serves as a useful cautionary tale for those of us (myself included) who dream of writing like the master E.C. Mills but often put our pens down in frustration at not being able to achieve the flawlessness of his exemplars. A good business hand is not an exercise in calligraphic precision. It is live writing. Yes, all script can and should be preserved, even enhanced by the recording process, but we must be very careful of blurring the precious distinction between these two types of performance.